Bacterial secondary metabolites (SM) are rich sources of drug leads, and in particular, numerous metabolites have been isolated from actinomycetes. 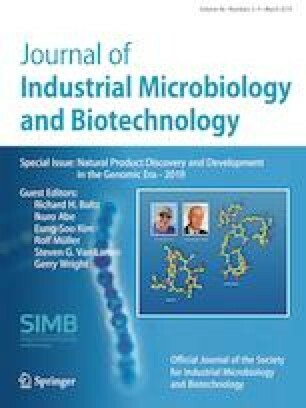 It was revealed by recent genome sequence projects that actinomycetes harbor much more secondary metabolite-biosynthetic gene clusters (SM-BGCs) than previously expected. Nevertheless, large parts of SM-BGCs in actinomycetes are dormant and cryptic under the standard culture conditions. Therefore, a widely applicable methodology for cryptic SM-BGC activation is required to obtain novel SM. Recently, it was discovered that co-culturing with mycolic-acid-containing bacteria (MACB) widely activated cryptic SM-BGCs in actinomycetes. This “combined-culture” methodology (co-culture methodology using MACB as the partner of actinomycetes) is easily applicable for a broad range of actinomycetes, and indeed, 33 novel SM have been successfully obtained from 12 actinomycetes so far. In this review, the development, application, and mechanistic analysis of the combined-culture method were summarized. This work was supported by Grants-in-Aid from the Ministry of Education, Culture, Sports, Science and Technology (MEXT), Japan, JSPS KAKENHI Grant nos. JP16H06443 (to I.A.) and JP18H02120 (to H.O. ), JST/NSFC Strategic International Collaborative Research Program (to I.A. ), Institute for Fermentation (IFO), Osaka (to H.O. ), Amano Enzyme, Inc (to H.O. ), JSPS A3 Foresight Program (to H.O. ), and JSPS Research Fellowships for Young Scientists (to S.H.). We would like to thank Dr. Shumpei Asamizu (The University of Tokyo) for providing useful advices, and graphical data used in the manuscript.